In this day trip, volunteers visit world famous monument of Taj Mahal. Taj Mahal is one of the finest examples of Mughal architecture. 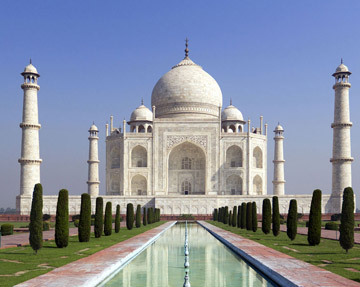 It is monument of love which Emperor Shahjahan got erected in memory of his beloved wife, Mumtajmahal. This is a must to do trip for everyone as one visits one of the Seven Wonders of the World. What’s more, you also visit to the historic Agra Fort, seat of Mughal Empire. The trip starts early in the morning at around 7 am as we pick you up from your location in Delhi and drive to Agra. we would take a short break for breakfast or light snacks en route. Once we reach Agra after driving for around 4 hours, we first take you to the world famous Taj Mahal. You get enough time to take lots of photographs and to see the majestic monument. Our tour guide would give you all interesting information about the monument and history. After the visit to Taj, we would take you for lunch in a local restaurant in Agra. Day trip to Agra as mentioned in itinerary by air conditioned vehicle. Services of professional driver and professional tour guide for sightseeing. Breakfast and lunch (at a local restaurant). Any personal expenses, TIPS, porter charges. Any meals apart from those included. Any soft drinks, beer or liquor bills, telephone, laundry charges and expenses of personal nature. Room service charges and mini bar consumption charges. Any camera fees, entry fees, additional guide charges. Any other services which are not mentioned in the package.